Keytars may have reached the height of their popularity in the 1980s, but don’t tell that to the Internet. If you do, it’ll probably shred you to death with synth sounds and finger tapping, all from the comfort of its own bedroom or home studio. On the internet, the keytar is alive and well. We’ve rounded up the best keytar solos to prove it. You don’t shred on the keytar wearing a tie. This guy knows what’s up. It goes down so smooth. Nothing completes the al fresco dining experience like a nice keytar solo. It’s all about the backdrop. No big deal. Just playing the keytar and guitar at the same time. And playing with your noodle. Where and how the magic happens. This is a little tune called Hit My Face. The best keytar battles always happen at Best Buy. Three minutes and thirty-two seconds of pure groove. 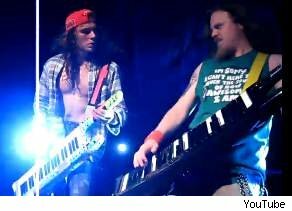 Metallica was made for the keytar.